Hyundai has revealed its i30 Fastback N at the 2019 Paris Motor Show. The five-door hot coupe is likely to be a niche model but offers a more practical version of the much-acclaimed i30 N hot hatch. With a bigger boot than the hatchback (450 litres vs 395 litres) and slightly more grown-up looks, the Fastback is set to compete with the Skoda Octavia vRS when it goes on sale early in 2019. While the rest of Europe will be offered a standard 250PS version of the i30 Fastback N, only the 275PS Performance version will be sold in the UK. This delivers 353Nm of torque and is capable of a top speed of 155mph, while 0-62mph takes 6.1 seconds - the same as the hatchback. Like the hatchback, the Fastback will offer drivers a choice of five different modes (dubbed the N Grin Control System...). Hyundai is keeping quiet about whether it will drive much differently to the hatch, which verges on the 'too harsh' end of the scale - but our early prototype drive suggests its suspension might be marginally more forgiving when left in 'normal' mode. Cosmetically, it looks broadly similar to the hatchback, with various N trinkets including sporty front and rear bumpers complete with a red stripe underneath, as well as an aggressive front grille. Inside is an N steering wheel with red N stitching. There's an eight-inch touchscreen multimedia display with Apple CarPlay and Android Auto. The N mode screen menu allows to driver to adjust engine settings, rev matching, the exhaust sound and performance settings. There's also a host of safety features as standard including autonomous emergency braking, driver attention alert, lane keeping assist and high beam assist. Since the five-door i30 N hatch went on sale in 2018, Hyundai describes its sale success as 'unprecedented' with almost 3000 sold throughout Europe in the first half of the year. 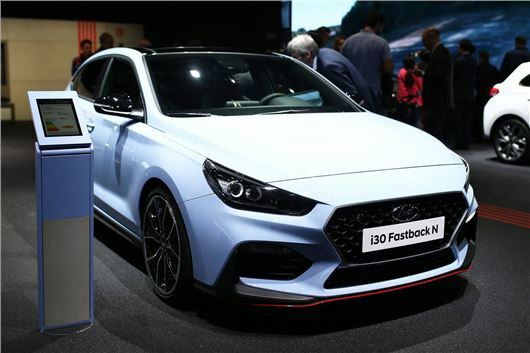 Alongside the i30 Fastback N, Hyundai's revealed the N Option show car, demonstrating a range of customisation options for buyers to soup-up their i30N hot hatch. They include 20-inch lightweight alloy wheels and a huge carbonfibre rear spoiler. Prices are yet to be confirmed for the i30 Fastback N but expect a premium of around £500 over the hatchback, giving it a list price in the region of £29,250. Just a shame that (at least from these pictures anyway) that the interior still has that 'acres of cheap-looking grey plastic' look to the it, especially the dash. I'm sure it goes brilliantly (I will wait and see about the ride, given the standard Fastback isn't very good on that score, even compared to the equivalent hatch) and looks good on the outside (I saw a standard model recently). Good boot space and accessibilty too. I'll reserve my overall judgemnent for now - too early to tell.